It's not enough to simply teach our little ones the basic skills of a sport. We believe that sports is the perfect vehicle to teach our children about life! JMG espouses the Growth Mindset v Fixed Mindset philosophy. All children learn and grow differently with different timing. We give personal attention to both child and parent on how to get through those times where it seems that your child is not engaged or emotions are running high. All children go through this. It is up to us to recognize and understand what is happening to them at every step of their development. We believe that perseverance and grit are 2 of the most important things for a child to learn at a young age for healthy development! Our soccer program has been so successful over these past 10 years, we have added more sports! We will use the same winning formula. 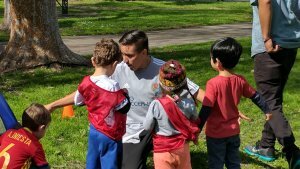 Experienced, professional coaches using sports as a vehicle to teach self-confidence, sportsmanship, communication and other socialization skills through FUN games and age appropriate skill exercises. We now have volleyball, basketball, flag football, swimming and dance! We can even set up interscholastic league games for all ages! FIFA World Cup is over! So we wait for the Women's World Cup in 2 years! Meanwhile we indoctrinate new soccer players everyday! The little ones' curriculum develops athletic skills through fun, age appropriate games like Jedi Training, Speed Racer and Super Hero! 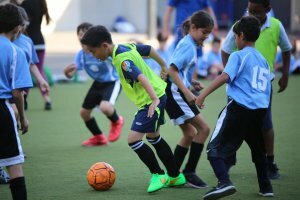 For older kids, skill, strategy & team formations are introduced via small sided games. Whatever age, character, teamwork and sportsmanship are taught using the tenets of the Growth Mindset. We are excited to have Volleyball in our JMG repertoire! We have successfully finished our several seasons at 5 of our schools. This is all in preparation for our 4th-6th graders to play in the Hollywood-Wilshire League. 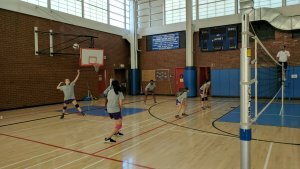 Our coaches love creating unique games that not only teach the fundamentals of volleyball but also promote leadership, teamwork and communication both on and off the court. Our parents are amazed at the progress the teams have made in such a short period of time. Whether it’s school tryouts or travel ball, we aim to increase player’s skill levels, confidence, and toughness on and off the court. Our basketball staff has years of experience playing and coaching at the high school, college and pro level. The pace of our workouts guarantees the maximum amount of repetition in a great learning environment. Our trainers take the time to explain the “when” and the “why” of each move to increase your Bball IQ! Whether your a Rams or a Chargers Fan, "Lets play some FOOTBALL!!!" JMG Flag Football programs aim to develop the TOTAL athlete mentally, athleticall, and socially. Each kids flag football clinic is designed to build football skills, grit, confidence, and team spirit using a GROWTH MINDSET methodology. Join our New Co-Ed Introduction to Dance Program. We will introduce students to different styles of dance from Hip Hop, Ballet, Jazz, Broadway and Contemporary. Movement, rhythm and choreography will be introduced. Dance will increase coordination, agility and flexibility while improving balance and spatial awareness, building confidence and self-esteem. We focus on technique, strength and endurance in and out of the pool. Seasoned swimmers have the opportunity for individual attention to identify key elements for improvement. For less experienced swimmers, we use the progressive float method to build water confidence and proper body placement to develop the necessary skills for various swim strokes. Students will be better prepared for any school swim team. Along with these skills we stress team, communication and school spirit!